With a need to find a reasonably easy place to walk in my new shoes, I thought I might go for a wander around the Makara Beach loop. The last time I tried to do this I discovered I was a week too late, and the farm-land section of the loop had been closed for lambing (which happens between 1st August and 31st October). So thanks to transport difficulties I’ve had in the past, this was the first time I’d actually walked the ridge part of the loop. 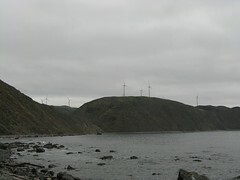 The Makara turbines of Project West Wind. 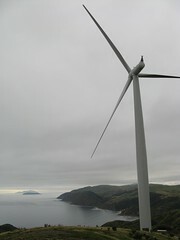 It’s hard to talk about the Makara Beach Loop these days without talking about Project West Wind — the initiative of Meridian Energy to build a giant wind farm on Wellington’s south coast. It took years to get through the consent process, and my most vivid memory of this was one of the few meetings I attended of the Tararua Tramping Club back in 2007. The meeting involved a representative of Meridian who described the wind farm proposal with a slide-show decorated by a large photo of a cute and happy dog basking in the wind, many noisy people whom I was later informed were not regular attendees of TTC meetings, and a lot of angry heckling. Location: Makara Loop Walk, from Makara Beach. Route: Just doing the loop clockwise starting from the beach. 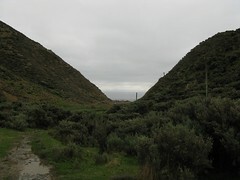 The wind farm has been controversial to say the least, especially for some residents of the small settlement of Makara separated from Wellington by the hills, who have been very concerned about the visual and audial impact the wind turbines would have on their community. 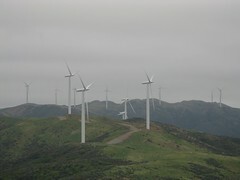 When the Environment Court approved the project in 2007, Meridian wasted no time in starting construction, and the hills in that area are now dotted with turbines. I hadn’t thought they’d be quite so obvious so close to Wellington, and so I was surprised just how obvious it was even a few minutes drive up the hill from Karori. The things are huge. The wind farm isn’t fully completed until the end of 2009, but it’s been operating in part since April. 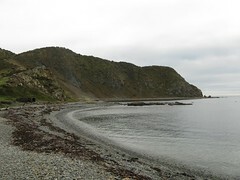 I started at Makara Beach at about 11.20, walked the loop in a clock-wise direction (over the hill to Opau Bay, then back along the beach), took lots of photos, stopped to look at lots of views, and arrived back at the car at around 1.30pm. Hovering all on its own. The loop doesn’t split until after a few minutes of walking, at which point the track leads straight up over farmland, and up and up. It’s not long before there’s some nice scenery out to sea. The South Island was only murkily visible today, but both Mana Island and Kapiti Island behind it stood out very impressively. From the beginning of the track, the only clear evidence that there’s a wind farm nearby is the single closest turbine, which the route spends much of its time weaving around. 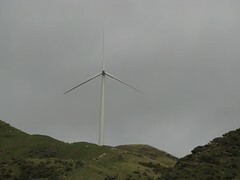 At the point that the higher track diverts up the hill, the full blades of this shiny white turbine are visible between the shoulders of the hills on either side. The walkway climbs up to the height of the base of this turbine, but for now it’s just a giant in the distance and with the perspective it’s difficult to gauge the height. I’d be very interested to see this massive thing operating simply to see how noisy it is, as noise has been one of the posted concerns of the lobby groups. 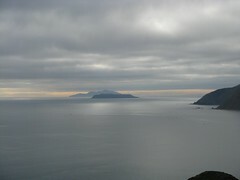 Mana Island (closer) and Kapiti Island (behind). It’s a nice coastal hill to walk along and with the direct exposure to the north, south and the west along the top, I bet it’s devastatingly impressive to wander around when it’s windy, but the air today was calm and still. The track goes up and up as it hugs the top of the shallow cliff-face above the sea, more or less until it starts going down. I already had blisters in my new boots by now, but that was okay because I wasn’t really in any rush. At about midday I reached the two WW2 gun emplacements. It’s about this time, walking around to the far side of the bunkers, that the scale of Project West Wind becomes clear. Suddenly the farm-land over the hills is covered in turbines. With my imperfect eyesight I counted at least 39 although they continue back into the distance towards the south coast and the total size of the farm is slated to be 62, which is a compromised down-scaling from the original plan before the lobby groups expressed their concerns. They’re all massive, each with a total 82 metre blade radius sidding on top of 67 metre towers! It’s a novelty for me to walk around near a wind farm, and I stood for a while just gaping at the scale of it, waiting for a couple of noisy people whose voices were carrying to approach and overtake me. Then in the relative silence with the noises of birds and the coastal sounds of the sea below, I watched several turbines in the distance as they lazily expressed their angular momentum obtained from what must have been a barely detectable breeze in terms of what would be the norm. Even at this lack-luster pace as one of those blades took 12 seconds for a full revolution of 258 metres (see the short movie), the tip was by my calculations moving at roughly 21 metres per second. That’s around twice the average speed of 10.36 metres per second of Usain Bolt, the current world record holder in the 200 metre dash (averaged faster than the 100m dash). There’s a lot of force in those blades, even when they appear to be drifting slowly. Despite concerns I have about the environmental effects that such wind farms can have in some places, my current personal opinion is that in the big scheme of things the Makara farm is a good design if wind turbines have to go somewhere. I guess putting them here in an area that’s already being used for farming and industry, high tension power lines and productivity certainly beats the prospect of changing the character of wilderness areas, forest parks and national parks. It’s shortly after the WW2 bunkers that the track curves around to the base of one of the nearest turbines. The road is gated off preventing access, but I snuck off the track by about 100 metres to a small point higher up where it looked as if many people had already been, and took a few photos of the turbine with Mana and Kapiti Islands in the background. It’s a nice spot, and soon after the track becomes a deteriorating asphalt road that leads down to Opau Bay on the coast. 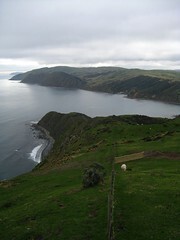 I reached the coast at about 12.30pm, and from here it’s a nice coastal walk back to Makara Beach. Looking back towards Opua Bay. And yeah, my boots went okay but I definitely have a couple of blisters on the back of my heels that I’ll need to deal with now. I probably should have taken some band-aids with me, but I wasn’t thinking so intelligently when I left home this morning. Hopefully with two or three more short walks like this, my new boots will be good for something more demanding. This entry was posted in daywalk and tagged coastal, daywalk, independent trip, tararua tramping club, wellington. Bookmark the permalink. So, could you hear the windmills making any noise? I never have when walking or cycling nearby. None at all, but they were also barely moving. It’s crossed my mind that if they’re making lots of noise, it might be eclipsed by the noise of the wind at the time. This is entirely hypothetical from my perspective, though.